For effect, you can adjust your camera or layer movements so they ease in or ease out of the keyframes. 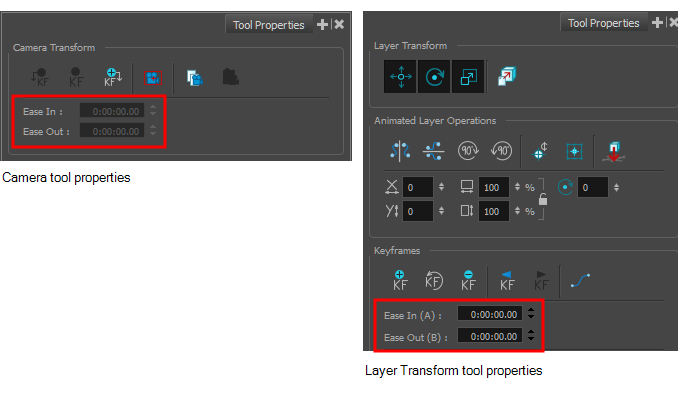 With the Camera or Layer Transform tool selected, the Ease In/ Ease Out parameters become available in the Tool Properties view. In the Timeline view, select a keyframe. From the Tools toolbar, select the Camera tool or Layer Transform tool. ‣ Ease In: In the Ease In section of the Tool Properties view, enter the duration of the ease in after the first frame in which the gradual change in camera or layer movement begins. For example, if you want to slowly accelerate to the normal camera or layer speed from frame 1-10, enter a value of 10. ‣ Ease Out: In the Ease Out section of the Tool Properties view, enter the duration of the ease out after the first frame in which the gradual change in camera or layer movement begins. Enter the number of frames before the last frame in which the change in camera or layer movement is gradual.